The Smoothwall System uses the concept of groups to provide a means of organizing and managing similar user accounts. Authentication-enabled services can associate permissions and restrictions to each group of user accounts, thus enabling them to dynamically apply rules on a per-user account basis. Users can be mapped to Default Users. The main purpose of this group is to allow certain authentication-enabled services to define permissions and restrictions for users that are not specifically mapped to a Smoothwall System group, that is, users that can be authenticated, but who are not mapped to a specific Smoothwall System authentication group. It is possible to add groups to the Smoothwall System. Currently, the Smoothwall System supports 1000 groups. 1. On the Services > Authentication > Groups page, point to the group and click Edit. 2. Edit the changes as required. For a detailed description of available settings, see Adding User Groups . 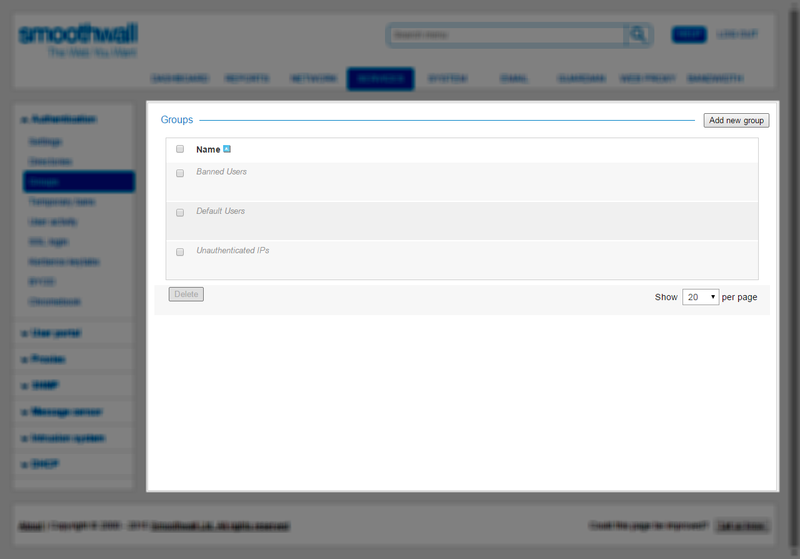 Once you have successfully configured a connection to a directory, you can map the groups the Smoothwall System retrieves from the directory in order to apply permissions and restrictions to the users in the groups. Note: These instructions are only for directories, not configured as Local users. For a detailed description of how to map local users, see Configuring a Local Users Directory . 2. Expand the relevant directory group, and click Add new group mapping. • Directory group — Depending on the directory service configured, add or select the directory group to map from. • Local group — From the drop-down menu, select the relevant group. • Enabled — Select this option to enable or disable the group mapping.